Roshi Bernie Glassman (zen master) is internationally recognized as one of the pioneers and guiding spirits of socially engaged Buddhism. He has based his life’s work on a commitment to service, born from his practice and mastery of the 2500-year-old tradition of Buddhist compassion and wisdom. Moshe: That’s good. So do you think the world needs more clown? Bernie: I would say: Needs more honoring of the clown part of ourselves. Everybody has some clown in them and to make it so that it empowers people to let their clown part speak is good. Moshe: To share their humor? Bernie: Yea, and it is not just humor, to share the clown doesn’t make mistakes, that’ s part of clowning. I mean the clown can operate in a full sphere; and many things that we would call clowning, people would get embarrassed about. Moshe: So did you say that the clown does not make mistakes? Bernie: They…yes …they don’t…. we don’t let…. like I always say, if you put a nose on Bush, then he says whatever he says and we could take it, OK that is what Bush is saying, because he’s made it legal by the nose for people to accept or not accept. Without the nose you get really pissed off and you are ready to kill him because, ah…. yea put a nose on the prophet and it’s not quite the same. You still hear it and still sinks in and it still means something; and you can take it or not take it but it’s not the same place at all. It’s the prophet saying…who does he think he is; or vice versa the prophet saying so I got to do whatever he says. For me that makes it very human to be able to see everything as it is and I take it or I don’t take it and if it seems funny to me I can laugh. If it seems absurd I can laugh if I want or whatever……. Bernie: Well, it’s been part of my world in some kind of natural way for a long time, but when I was sort of phasing out of being in charge of different kinds of organizations and Zen centers and things of that nature and installed a lot of people into running these things; one of the things that kept grabbing me is how people felt, how they were taking themselves too seriously. So I was really looking more at the trickster role, coyote role than the clown role. When I thought of clowning, that was more to getting some technical skills to be able to do the other work in a better way. But I really felt it very important that one phase of our work has to be to make sure that people don’t take themselves too seriously or see the gates or the armor that they are building in doing their job and how to make it more inclusive. 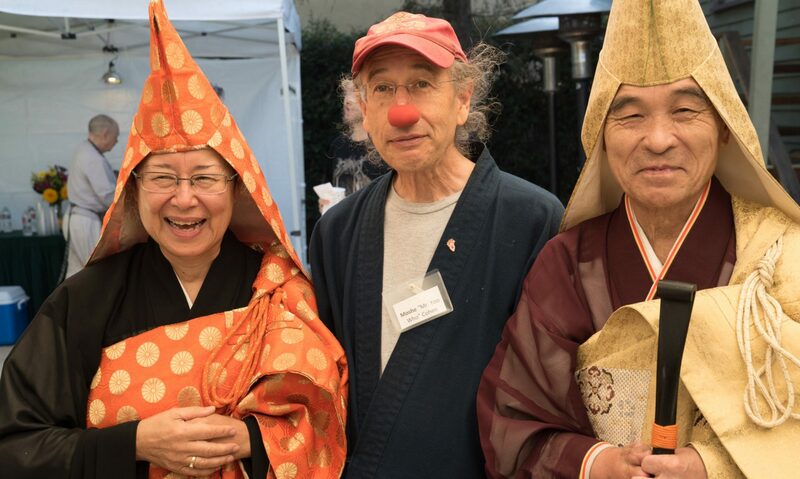 I thought that a fun way of doing it or a good way of doing it is to sort of visit them in the role of the clown or the jester and poke fun at ways that I felt they were blocking the world from entering their spheres. You know it is interesting that Clowns Without Borders, that very term ‘without borders’ that is the kind of word that I use-I talk about no inside no outside, that everybody draws a circle and that’s their border. Everything that they don’t see as part of them is outside that circle. So, when you say without borders, that means the circle is infinite, everything is inside. Yet it’s very hard for us to be open to all sides. Things push our buttons and then we really build a border, and point to the enemy. I think that it is an important role trying to really get rid of those borders. That doesn’t mean that you don’t do a lot of work with pieces within you that you think are not so healthy; just like in your own human body. I mean cancers they’re part of you, you’ve got to work with them but just to call them the enemy is not good enough. 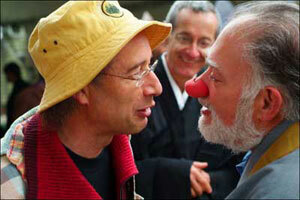 Moshe: Do you think that there is any difference between clown and fool and jester? Bernie: Well the way people use the words, probably. Even between ‘jester’ and ‘nar’, I think there’s a different feeling. I think the European sense of ‘nar’ is deeper than the English sense of ’jester’. Bernie: Well there was the court jester, but it was really clear that that was the role of pointing out that….what word am I looking for…the arrogances…or the…. Bernie: Yea all of that stuff. Every system needs that role and creates it in some way. The ‘nar’ was created in medieval Europe to do that role in the kingdoms. It is like ‘carnival’ for the catholic world. It is so straight, you need release, so it something you can allow to point out the various armors or borders or whatever…if you don’t do the release, release isn’t enough. I mean it’s got to be worked on more; because systems will create a release so they can last longer, so they won’t have as many revolutions and all. So even with the ‘nar’, if you went too far they could get killed even though they were supposed to be protected. Whereas a jester, I am not sure what English means by the jester. It is a little bit more like a fool, huh? Bernie: It had that role but we sort of forget that a little. Some people think that the role was more to bring humor, to make everybody laugh there; not necessarily to help change the system or keep the system honest whereas with the coyote, definitely, that is part of their job, to make sure that the priests, the leaders, that they walk their talk. That was definitely part of their job. It was part of the jester’s job but we’ve lost sight of it I Think in the way people think of the word. Moshe: Would you find any parallel in modern day’s society? Is there something going on in the entertainment world that you can point to that has a similar role? Bernie: yea, Saturday Night Live, Mort Saul, Trousdale…we allow that world, it is not so huge and we don’t have a government role or a corporate role but it would be good to have that.